I designed the wedding invitations for my friends Amanda and Erick. 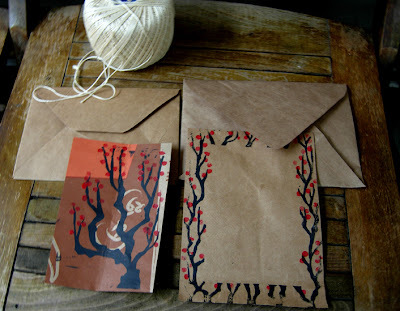 They are block prints on 100% recycled brown paper bags. On Saturday a whole troop of us ironed a trillion paper bags,traced and cut out 200 envelopes, 200 block prints that will become the invitation (we are going to hand stamp the text with a factory made stamp)and the RSVP card. You can see photos from the day here. That is completely amazing! What a cool idea.